*Gently taps screen* Hello! Hello! Anyone home? I've been neglecting this blog a lot lately. 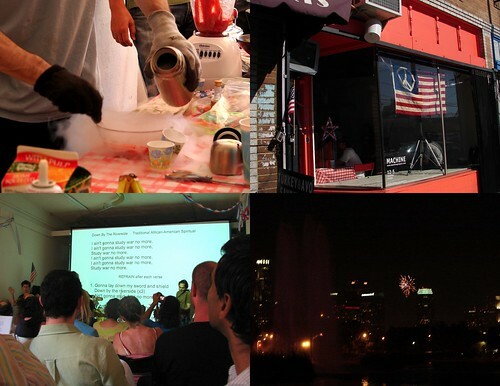 I don't have a lot to say at the moment, but in an effort to get back the groove of working on my many projects and interests, here's a glimpse of how we spent our 4th of July in a fairly non-traditional, but oh-so-fun way in Echo Park. Machine Project's members-only Freeze-B-Q. Everyone brought food and beverages and we experimented freezing them with liquid nitrogen. I now think I know how the marshmallows in Lucky Charms get their texture! Not everything worked, but a blended mix of fruits with a little rum thrown in seemed to turn out great. Machine Project from the street. In the evening, a group of musicians lead folks in a sing-a-long. Lots of traditional songs. It was bizarre and fun. People really go into it and I felt like I could sing out in my out of tune voice. Independent (*ahem*...illegal) fireworks over the Echo Park Lake. Downtown L.A. in the background. Every year, lots of people put on their own displays of fireworks in Echo Park for hours and hours. We walked down to the lake, which was interesting as we walked right by some fireworks being shot off. I'm a little twitchy about that sort of thing. It was lovely until the po-po kicked us out of the park for "trespassing." It was bogus because it was only 9:30 and the park is open until 10:30, but arguing with the LAPD never seems like a wise idea. We topped the night off with dinner at one of our favorite Thai restaurants. I'm always amazing at the fun things you do. Machine Project sounds so awesome! Where do you find the energy? Looking great. Hope you had fun.